Robert Hirsch has worn many hats in the world of photography: educator, editor (Digital Camera (UK) and Photovision magazines), bestselling author (multiple editions of Exploring Color Photography, Photographic Possibilities, Seizing the Light, and Light and Lens), contributing writer (The Focal Encyclopedia of Photography, The Photo Review, photo technique magazine, and more), artist, curator, Executive Director of CEPA Gallery, and as a voice and documenter for the fine art contemporary photography movement that began in the 1960s. Mr. Hirsch chatted with us about his latest book, Transformational Imagemaking: Handmade Photography Since 1960 (Focal Press, 2014), which, as you can imagine, is a project of passion. What was your inspiration for writing your book, Transformational Imagemaking? It’s an area that I’ve been deeply interested in throughout my photographic career. I’ve always been intrigued by photographs that have the “fingerprints of the maker” embedded in them. The traditional view of how the majority of people see photography is referred to as the “window on the world” view: that photography is based on selection and pictures are taken as opposed to made. Such photography reflects a model of outer reality based on Renaissance perspective, which is what has made up the Western canon of vision for the last 500 years. When most people look at a photograph, they expect to see a representation organized around these concepts. The principal social contract that photographers have had with society has been to act as a surrogate witness, a stand-in for what viewers would have seen if they had been present. My position has been that all photographs are constructions. The “window on the world” point of view is based on where the photographer is standing, the time of day, the quality of light, what equipment and processes are utilized, what is included and excluded in the frame, and so on. What determines the photographic outcome we see in magazines, museums, galleries, and in all forms of media are largely determined by this realistic perception mindset. I’m interested in haptic imagemakers who are expressionistically interpreting their subject matter. In place of an outward linear narrative, these artists often rely on an inner psychological approach to their storytelling. This encourages their unconscious to come to the fore and reveal multiple pathways for viewers to explore both the subject matter and the maker. 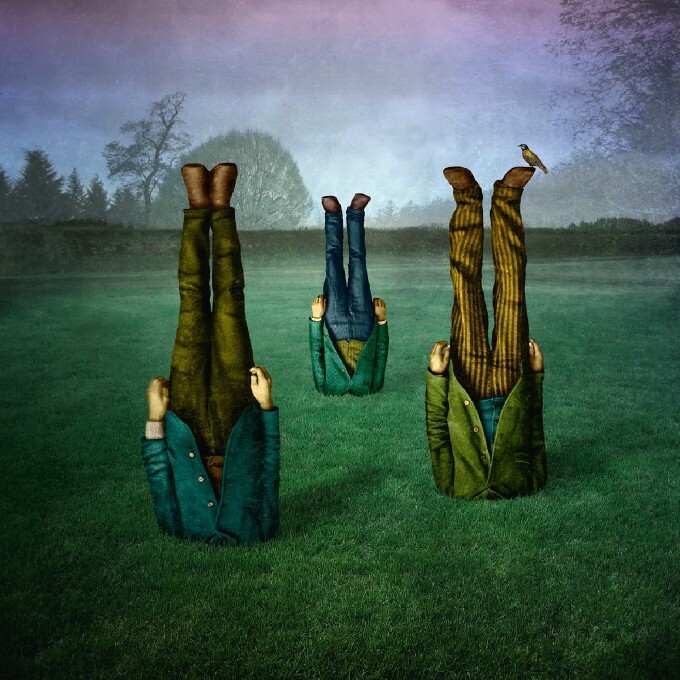 Regardless of their approach, these artists delight in the act of picturemaking. How did you narrow down your choice of featured photographers? That was tough. As these makers are very independent, they did not follow a linear trajectory that I could track. So I started by mapping a few key people who I thought influenced the direction of this way of making pictures, concentrating on the 1960s as the starting point. What I discovered was unseen connections, which were not apparent on the surface. This is where the interview process was really eye-opening because it revealed these uncanny associations. Being familiar with these artists, I had an idea of where and how this way of making pictures came about. There seemed to be two distinct schools: one on the East Coast and another on the West Coast. I narrowed it down to people who were working in Rochester, NY, and Los Angeles, CA, and that became a gateway to other people. Of course, over time the people in Rochester and LA migrated to other places and spread their ideas. I just looked Robert Heinecken up in your book so I could have a visual as you discuss. He is amazing. After Robert Heinecken, there’s Darryl Curran. Curran was a student of Heinecken’s and became his teaching assistant. Then Curran became a teacher and went on to influence a whole generation of students. There were all kinds of connections like this. After Curran, there’s Todd Walker. Walker was teaching at the Arts Center in LA and he ended up teaching with Heinecken, and then with Jerry Uelsmann and Douglas Prince, who are also in the book. Prince taught with Jerry Uelsmann for a number of years. There were numerous examples of such synchronicity of people and places coming together. © Robert Heinecken. 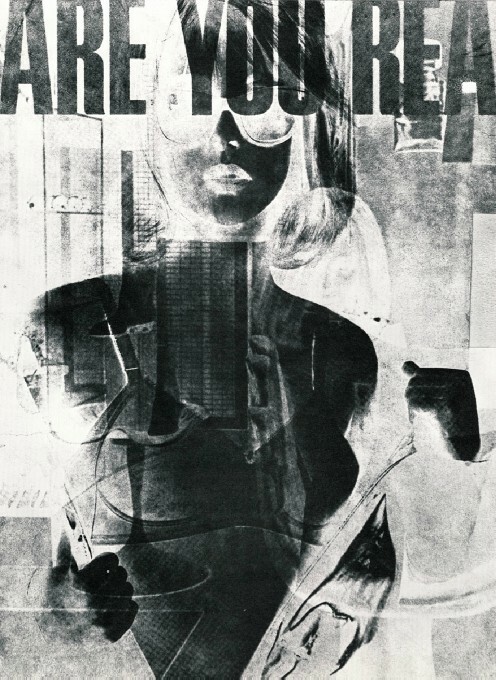 Are You Rea #1, from the series Are You Rea, 1966. 11 × 8 1/2 inches. Gelatin silver print. Courtesy of the Heinecken Estate. Can you explain how you decided to break these people out into different sections? I relied on the interview material to set it up. I started on the West Coast because of its laissez-faire attitude. New York was much more controlled by the art market. This is one of the reasons why there was more experimental activity on the West Coast while Rochester was the seat of investigations into historical processes. Conditions were just too uptight elsewhere, and the interviewing gave me a vision of a new family tree. I could trace the main branches from LA and Rochester to other centers of activity in Chicago, Gainesville, Albuquerque, Philadelphia, and so on, providing direction for laying out the book. Based on that model, and using Heinecken as the “Grandfather Figure,” the text moves chronologically forward in time. There is a generational stepladder one can follow, starting with the eldest makers and wrapping up with the youngest of the makers. Their common bond is the capability of generating numerous responses to a question as opposed to a single “correct” answer, which is essential to authentic originality. I love that, though it wasn’t your original intention, this ended up being a book about relationships, too. That’s true; it was based on relationships. Even if people weren’t directly in touch, they were aware of what the others were doing. For instance, one of the artists who had a career breakout in recent times (Chris McCaw who makes the Sunburn pictures in the book starting on page 206) went to school in San Francisco where he met Jerry Spagnoli, a well-known artist and teacher also featured in the book. McCaw installed the shows at San Francisco Camerawork for about 10 years. His everyday job put him in touch with people who were making work on the boundary lines of photography. © Chris McCaw. Sunburned GSP #676, (San Francisco Bay), 2013. 8 × 10 inches. Gelatin silver paper negative. Courtesy of Yossi Milo Gallery, NY, NY and Stephen Wirtz Gallery, San Francisco, CA. I think it is important for people to understand that, though the subtitle of the book is Handmade Photography Since 1960, the book does end with very contemporary photographers. In fact, the last person you feature—Matthew Grant—graduated with an MFA in 2008. The trajectory of the book sees imagemaking in the broadest possible way, going back to photography’s root meaning, writing with light. I embrace makers who create images through the agency of light, regardless of the process or technique. I don’t care whether the work involves a lens, film, chemistry, or a digital sensor. These makers interject themselves and establish a personal interaction with their subject matter that directs the outcome. The artists literally have their fingerprints or DNA infused in their work. There’s no pretense of being an automatic, objective outsider who is standing in as a witness. They are telling their own authorial stories and invite viewers to join in. That was something I wanted to talk with you about—your definition of “handmade” photography. That’s your definition right there, isn’t it? Yes, and one of the words that is essential in describing handmade photography is “haptic,” Greek for “sense of touch,” which I use in its progressive sense. Photography is based in technology, which is always evolving. Artists find new ways to incorporate themselves into their work. 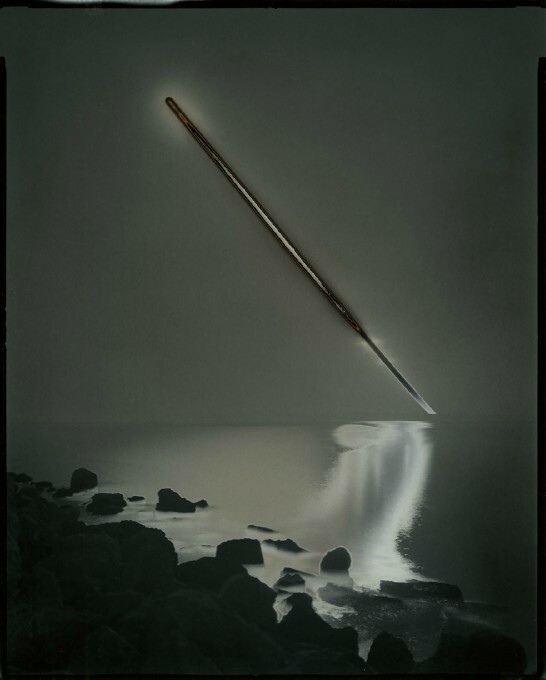 Maggie Taylor, for example, physically collects objects, places them on a scanner, uses the scanner as the camera, and then imports the images into Photoshop. She then utilizes that technology, in a manner that pays homage to her husband Jerry Uelsmann’s work, to create photographic montages. 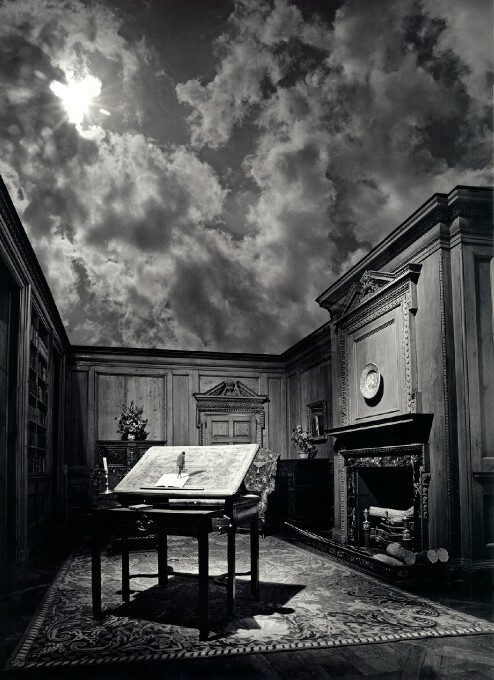 The difference is that Uelsmann established his methodology in the darkroom during the pre-digital era. © Jerry Uelsmann. Man on the Desk, 1976. 20 × 16 inches. Gelatin silver print. I’m not attached to nostalgia or the notion that old things are more interesting than new ones. I’m for incorporating new technologies. For instance, artists who are capturing images on their smartphones and then making prints instead of just sharing them on a screen fascinate me. 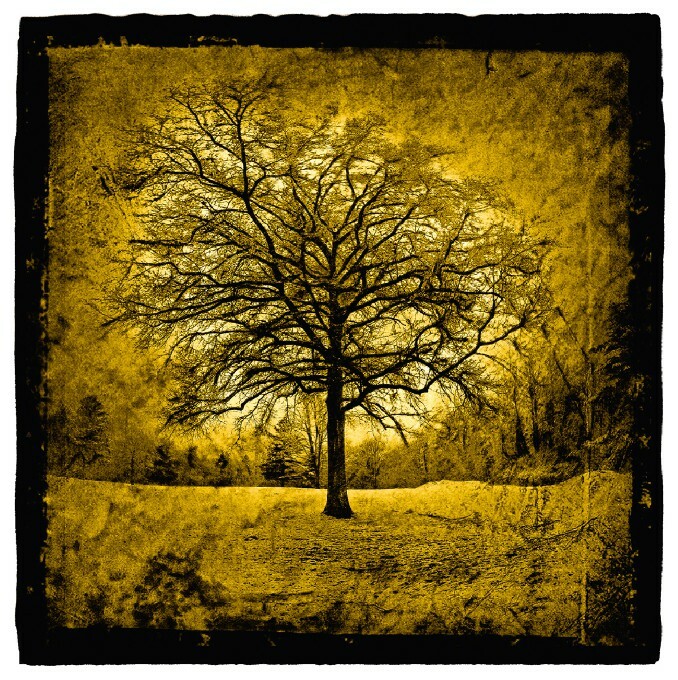 Dan Burkholder makes elaborate handmade prints with gold leaf from his iPhone camera. One of the great paradoxes is that what we see now—in digital montage practices—can be traced back to methodologies developed in the 1860s by Gustav Rejlander and Henry Peach Robinson and revived by Jerry Uelsmann in the 1960s, which acknowledges and embraces the notion that photographs are fabrications. © Dan Burkholder. Tree in April Snow, Catskills, 2011. 10 × 10 inches. Platinum/palladium on vellum over gold leaf print. Courtesy of the Catherine Courturier Gallery, Houston, TX. Think of what we see now, especially on social media. People are using photography in a highly personal way to communicate, and they have no qualms about altering their images. We know programs, such as Instagram, are widely used by younger people who are not what we’d traditionally call photographers. Now, with high-quality cameras built into mobile phones, we’re all photographers. Photography continues to become more universal and a language people rely on to connect with one another in a daily fashion. What Heinecken pioneered with his “reuse” of popular media has now filtered down to the public. Yes, I think of talented photographers—like Brooke Shaden for example—whose work is very surreal yet completely digital. The fundamental concepts of photographers of this realm are rooted in the “founders” at the beginning portion of your book. The introduction traces that history. The idea of interacting with the photography process happened pretty much the day after the invention of photography was announced! [Laughs] If you go back to the unveiling of the daguerreotype in 1839, people were stunned and amazed, but they also immediately started complaining about the lack of color. Within a short time, a cottage industry of hand-coloring daguerreotypes sprouted up. From the dawn of photography, we have that kind of interaction: taking what the camera has recorded and adding an individual twist to it. By the way, Brooke Shaden was a student at the Tyler School of Art at Temple University in Philadelphia: a city where a number of the artists featured in the book—such as Catherine Janson, David Lebe, Will Larson, and Martha Madigan—lived, worked, and taught. Do you believe there is a line between a photographic artist featured in your book as opposed to a mixed media artist? I think there is an arbitrary line. In all cases, people are attempting to expressively communicate something personal about their subject matter. I don’t care whether you are taking a Cartier-Bresson “Decisive Moment” approach or coming at it like Rick Dingus, who draws directly on a photograph. For me, what is important is how you visualize what you are seeing and thinking in your head… How you make that vision materialize on paper or on a screen. I want to get away from neatly dividing things up, so instead I talk about what I call “the possibility scale.” It postulates that there are no artistic levels of impossibility, only different levels of possibility. It goes to the heart of the Big Artistic Question: How does one visualize the essence of what you imagine in your head? For me, the work that resonates over time, regardless of approach, is made when someone takes a subject and presents it in a way that we haven’t seen before. It’s about seeing things differently, things that have been hidden, things that are strange or unknown, and probably most importantly, things that have previously not been thought of. Let’s talk about the term “alternative technique.” I picked up on the fact that you don’t necessarily love that term. Yes, that is a bone that I’ve picked at for some time. It goes back to an article I wrote, Flexible Images: Handmade American Photography, 1969-2002, where I discussed this issue. To me, “alternative” is both inaccurate and insufficient. It is also a form of negation because it fails to speak to what these artists are really about. When you say that it is an alternative, it characterizes photography as a predetermined single set of approaches. Referring to the work as alternative is implying that it is illegitimate. I know the term continues to be used for the sake of continuity. Transformational Imagemaking discards any such disapproving definition in favor of one that embraces all images created through the action of light, regardless of how they are fabricated. Do you see a movement by instructors in fine art classes to have students work on handmade photographs? When students take beginning photography classes, it behooves the instructors to teach the students to use digital methods, as at some point all images will likely become digital. However, within the students who seriously pursue photography, there is a subgroup that pushes up against the limits of what a repeatable algorithm can do. As it is predictable, an algorithm eliminates chance and surprise. Professors have told me that they have students wanting to experience the darkroom and experiment with analog processes and actually get into hands-on making. Also, they desire the opportunity to introduce the element of serendipity that can occur while working with these processes. Unexpected things happen! [Laughs] Sometimes they are failures and you have to accept that, but such “fortuitous happenstance” can take you in a new potent direction. Just as how penicillin was discovered by chance, those who have a prepared mind and have mastered what has come before are in a position to recognize an accidental breakthrough. The processes we employ to make our images confine us all. When using Photoshop, it is difficult to get past the parameters that are built into it. However, anyone who has spent time working in a darkroom realizes how few boundaries there are. That’s where the appeal lays. It really lets your imagination investigate things to the fullest, encouraging an ongoing exploration into the nature of picturemaking. This forward motion of discovery is a good thing! A major exhibition based on the book will open at CEPA Gallery in Buffalo, NY on September 19, 2014 and run until Thanksgiving. Please visit www.lightresearch.net for more about Robert Hirsch. To purchase his new book, Transformational Imagemaking: Handmade Photography Since 1960, visit www.FocalPress.com. © Robert Hirsch. 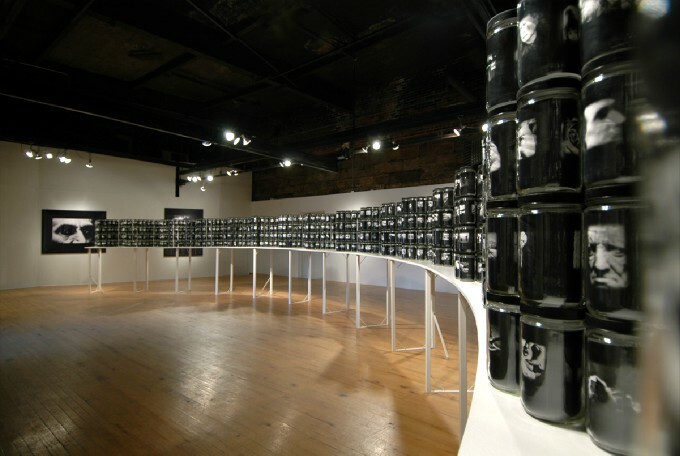 World in a Jar: War & Trauma (Big Orbit Gallery installation view), 2005. 50 × 3 × 4 feet. Electrostatic prints in 32-ounce glass jars. World in a Jar: War & Trauma is a collection of 1001 hundred black & white photographs, each preserved in a clear 32-ounce glass jar with a black lid. The photographs are made largely from portions of appropriated historical images that have been re-photographed to emphasize a litany of horrors that have occurred over the past three centuries. Each jar contains two of the same images on a black field so that when the jars are viewed, the same image is visible from either side. The jars are stacked and displayed in a serpentine pattern on a white minimalistic, fifty-foot arch-shaped pedestal. Ten individual images, enlarged into 40 × 60-inch prints, are hung on the walls around the installation. For more information, click here. © Robert Hirsch. 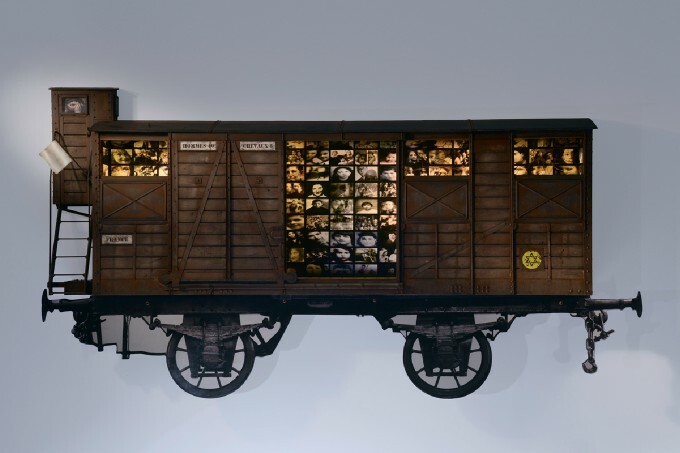 Ghosts: French Children of the Holocaust (Boxcar #3), 2014. 5 × 3 × 1.5 feet. Inkjet print with mixed media. Ghosts: French Holocaust Children is a memorial to the more than 11,000 Jewish children who were deported from France to Auschwitz and other Nazi death camps. At most, 300 of these children survived. The project is based on documents and photographs collected by author, lawyer, and Nazi-hunter Serge Klarsfeld, which Mr. Hirsch has reinterpreted through two- and three-dimensional photographic representations to convey a haunting sense of lost human possibilities. Hundreds of children’s portraits are presented inside of three 5 × 3 × 1-foot handmade models of World War II-era 8/20 railroad boxcars. For more information, click here. 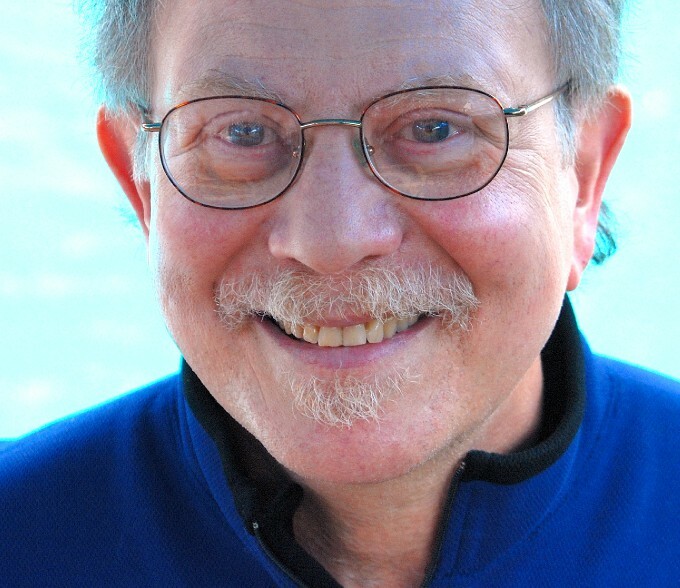 For more information about Robert Hirsch’s visual and written projects, see: www.lightresearch.net. I really enjoyed this interview. Nice work Cara and Robert! The book is fantastic too. thanks!